Six nights at the hotel (Monday night through Saturday night, checking out on Sunday morning) is included in the price. 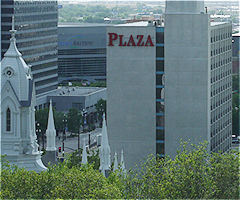 Just arrange your travel to Salt Lake City and we take care of the rest. Spend additional nights at the hotel before or after the event at our SPECIAL GROUP RATE. Details will be provided in our Welcome email sent to you after you have registered. Each room includes a refrigerator, microwave and free wireless hi-speed internet. A full service restaurant is attached to the hotel with room service available.